Working on rebuilding and restoring the factory A/C system in my 85 Bronco. I've come across a wire on the pressure switch that I have no idea about where it goes. I'm not seeing any other plugs it could go into. Anyone have any ideas? Or could take a quick look at theirs and help point me in the right direction? 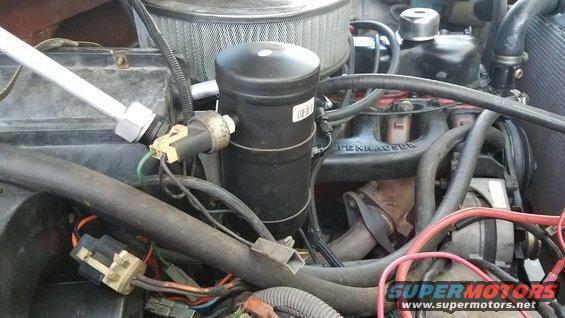 Fast idle solenoid for the carb you no longer have? Not in this case, since the vehicle (and the A/C system) was originally equipped with a fuel injected 302. Last edited by AbandonedBronco; 04-13-2019 at 08:08 PM. Sorry, I can't determine the wire colors. Looks like it goes to the "Electronic Engine Control" and is used to add a few revs to the engine when the A/C is engaged. My Sniper EFI system has a wire just for that, and will kick up the idle when it's on. So, it looks like I connect it to that.